Hi @tima_t, please keep us up to date and summarise what is going on on your side (technically and in general). Very interested to read more! 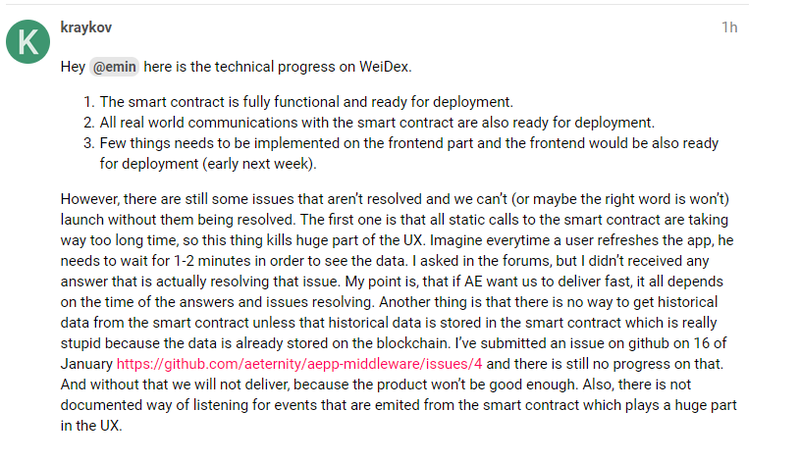 Hey @emin here is the technical progress on WeiDex. The smart contract is fully functional and ready for deployment. All real world communications with the smart contract are also ready for deployment. Few things needs to be implemented on the frontend part and the frontend would be also ready for deployment (early next week). However, there are still some issues that aren’t resolved and we can’t (or maybe the right word is won’t) launch without them being resolved. The first one is that all static calls to the smart contract are taking way too long time, so this thing kills huge part of the UX. Imagine everytime a user refreshes the app, he needs to wait for 1-2 minutes in order to see the data. I asked in the forums, but I didn’t received any answer that is actually resolving that issue. My point is, that if AE want us to deliver fast, it all depends on the time of the answers and issues resolving. Another thing is that there is no way to get historical data from the smart contract unless that historical data is stored in the smart contract which is really stupid because the data is already stored on the blockchain. I’ve submitted an issue on github on 16 of January https://github.com/aeternity/aepp-middleware/issues/4 and there is still no progress on that. And without that we will not deliver, because the product won’t be good enough. Also, there is not documented way of listening for events that are emited from the smart contract which plays a huge part in the UX. How come no one answers the following questions? Can’t he ask the question AE can’t solve? Who will develop aepp based on AE in the future? @xupei those questions will get answered as soon as possible, development takes time and I am sure @kraykov is aware of that. Thank you. I’m worried about ae, too. Thank you. We are here to help each other and to build awesome AEpps! Six days，as soon as possible. Hey guys, I checked with the dev team and learned that the question was answered in a different channel (GitHub if I understood corectly). @ae-vlad just pointed me here. The question somehow slipped through because the title of this post doesnt implicate a problem. Please, for the future, make separate topics for technical questions. This will also help others to search and learn about similar problems. I’ve implemented a first version of contract call decoding, and I’ll make a release of it in the next few days. Sorry it’s taken so long, and thank you for your patience. Fantastic @jsnewby Thanks a lot. Hope this will solve your problems @tima_t! @kraykov will check the updates and hopefully we will have everything needed to launch the DAEX. 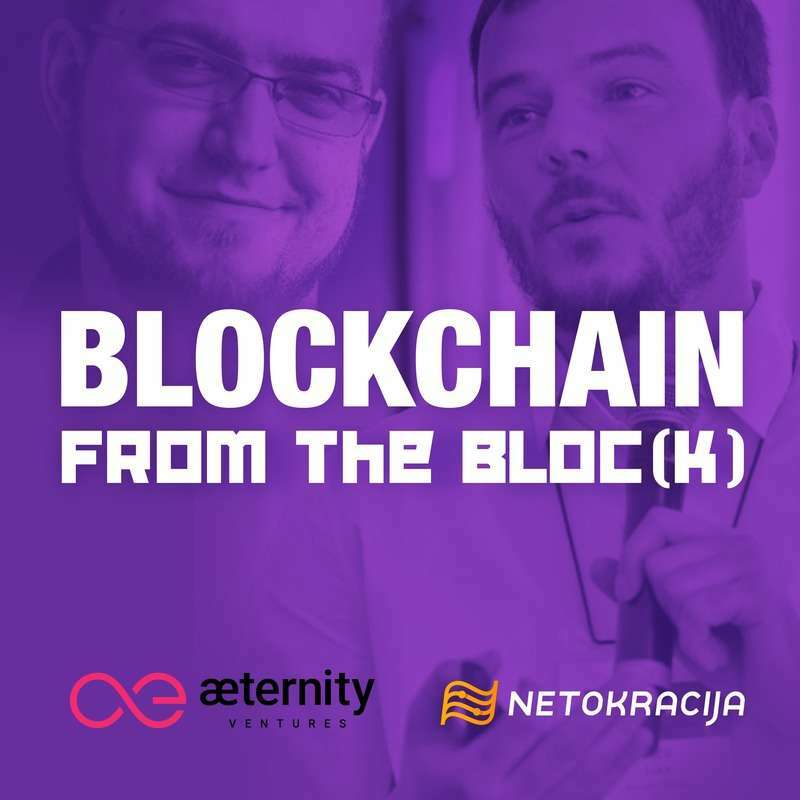 Listen to the podcast Blockchain from the Block with Tito Titov - talking about the advantages and disadvantages of trading on decentralised exchange. Here out how DEX came to life, why they are here to stay, and, as Ivan triumphantly made a real 'meta' point: are the decentralized exchanges to cryptocurrencies what blockchain is for the real world? I will definitely listen to this. After the delisting of Bitcoin SV from major [centralized] exchanges, it becomes very clear that these centralized entities have a significant power over the future of any project in the space. DEX-es can shine! BLOCKCHAIN FROM THE BLOCK podcast!